One of the pleasant surprises for those who utilized the HORAL buses during the 2011 edition of Toer de Geuze is that the organizers distributed a reproduction of the 1560 Halle ordinance for lambic brewing. The accounting document that includes the ordinance does not explicitly refer to “lambic” yet, but the proportions of grains and the fact that all historical beers involved spontaneous fermentation prompted researchers to establish a link to modern lambic. This 1560 text (1559, according to other sources) was discovered by Médard-Jules Van den Weghe in 1930 but it was not until 1971 that the link to lambic was made by Marcel Franssens in the journal “Verhandelingen van de KGOKH.” Since it was custom to include older ordinances in the accounting books there is good reason to assume that the ordinance itself is much older than 1560, going back to at least 1400. The ordinance concerns two issues: enforcement of decrees concerning the required amount of grain in wort and specification of the proper proportion of wheat and barley. Item Est statue et ordonne pour le plus grant prouffit de la ville que doresanvant on brassera keute et houppe sur le pegele et selon la valleur des grains ainsy que lon est acoustume de vielz temps. Et qui brassera oultre le pegele tel fourfera une amende de vi L ts pour la premiere fois et ne porra faire son mestier durant lespace de xl jours. Et la cervoise quon trouvera estre brassee plus q’le peghele contient seroit confisquie au prouffit du Sr. Et pour le seconde fois sur lamende de xn L ts Et pour la me fois sur paine destre prive du mestier a la volente du Sr. De laquelle amende le Sr auera ung tierch. L autre tierch sera au prouffit de la ville. Et lautre tierch au prouffit du Rapporteur. Et polre les maltoteurs aller avec le peghelere sil leur plaist pour enquerir et scavoir si laditte cervoise est brassee trop longhe. Que les brasseurs qui voldront enthoner leur cervoise ilz fourferront lamende de XV S ts pour chune fois au prouffit du Sr. Et le peghelere sera creu par son serment tant de lamende cue de la cervoise et leike. Item Que nul sadvance de faire de bree sans y mettre xvi Rxes de grains Assauvoir vi Rxes de fourment et x Rxes dorge et dave qui font ensamble xvi Rxes ainsi quon a este acoustume du temps passet pour le faire mesurer dedens le moulin quant on sera requis par le mayeur et eschevins. The last part of this ordinance concerns the proportion of wheat and barley. Nobody shall make a wort without 16 raziers of grain, 6 raziers of wheat and 10 raziers of wheat and oat, in total 16 razieren, according to custom and to be measured in the mill upon request from the major and the members of the municipal executive. A “razier” is an old unit for measuring grain corresponding to 50 liters and the ratio of 37.5% wheat to 62.5% barley corresponds roughly to today’s lambic brewing practice and regulations, which require a minimum of 30% wheat. Also note the mention of “oat” in the ordinance. 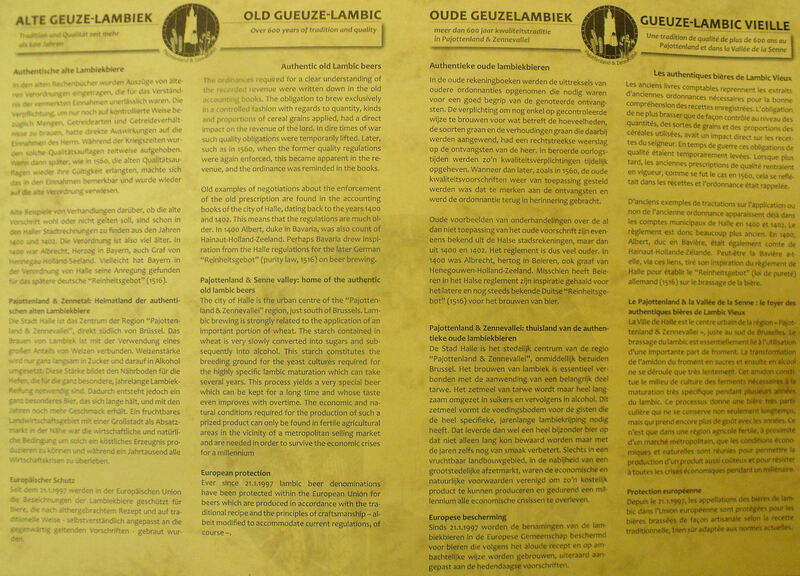 The reproduction of the ordinance that was distributed at Toer de Geuze 2011 is double printed and contains some information about the historical context and significance of the ordinance in four languages. The ordinances required for a clear understanding of the recorded revenue were written down in the old accounting books. The obligation to brew exclusively in a controlled fashion with regards to quantity, kinds and proportions of cereal grains applied, had a direct impact on the revenue of the lord. In dire times of war such quality obligations were temporarily lifted. Later, such as in 1560, when the former quality regulations were again enforced, this became apparent in the revenue, and the ordiance was reminded in the books. Old examples of negotiations about the enforcement of the old prescription are found in the accounting books of the city of Halle, dating back to the years 1400 and 1402. This means that the regulations are much older. In 1400 Albert, duke in Bavaria, was also count of Hainaut-Holland-Zeeland. Perhaps Bavaria drew inspiration from the Halle regulations for the later German “Reinheitsgebot” (purity law, 1516) on beer brewing. The city of Halle is the urban centre of the “Pajottenland & Zennevallei” region, just south of Brussels. Lambic brewing is strongly related to the application of an important portion of wheat. The starch contained in wheat is very slowly converted into sugars and subsequently into alcohol. This starch constitutes the breeding ground for the yeast cultures required for the highly specific lambic maturation which can take several years. This process yields a very special beer which can be kept for a long time and whose taste even improves with overtime. The economic and natural conditions required for the production of such a prized product can only be found in fertile agricultural areas in the vicinity of a metropolitan selling market and are needed in order to survive the economic crises for a millennium. Ever since 21.1.1997 lambic beer denominations have been protected within the European Union for beers which are produced in accordance with the traditional recipe and the principles of craftsmanship – albeit modified to accommodate current regulations, of course.